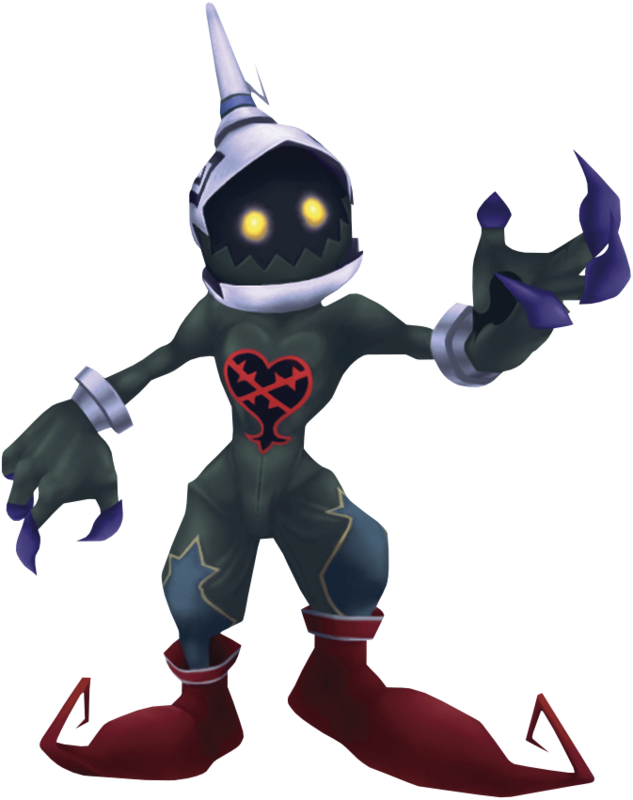 A stealthy Heartless similar in appearance to a Soldier. It appears alongside other Heartless and deals attacks from afar. Although a troublesome enemy, it shows itself once its weakness is uncovered. The Stealth Soldier is an Emblem Heartless that is found in Kingdom Hearts Final Mix. A Stealth Soldier is a humanoid Heartless with dark grey skin. It has large hands with blue claws and wears tattered, red boots with curled toes. It also wears silver bracelets and faded, blue knee guards. Its pitch-black head and glowing yellow eyes are visible under its silver helmet, which is decorated by a curled antenna and two angular, black spirals. The Heartless emblem is emblazoned on its chest. The Stealth Soldier's name reflects its ability to become invisible. These enemies appear in Hollow Bastion and are very dangerous due to their high speed and ability to charge right through Sora. They are also invisible until hit enough times. This can be especially damaging while Sora is only equipped with his Wooden Sword. Using Beast or magic at this point is very advisable. Once Sora regains his Keyblade, and if his stats are still low, it is advisable to use the Stop spell before attempting to attack. When the Stealth Soldier attacks by running into Sora, this may cause Sora's weapon to fly out of his hands. Once it is seen, defeat it immediately. Casting Aeroga immediately when a Stealth Soldier is spotted will help reduce damage taken, and reduce its HP in the process. Stealth Soldiers sometimes spawn in the Entrance Hall. Before the rescue, a single Stealth Soldier will appear in the middle of four Darkballs in front of the fountain. And another near a Defender and two Wizards at the top of the stairs, near the Lift Stop. After the rescue, three Stealth Soldiers will appear if only one Large Body appear in the area. If two Large Bodies appear, the Stealth Soldiers will not appear. The quickest way to destroy Stealth Soldiers is to cast Stop spells and deal a single combo before casting stop again. This process can use up a lot of MP if your Strength stat is not high, so it is recommended to stockpile a few Ethers before hunting them. This page was last edited on 12 February 2019, at 13:39.